Fun, beautiful and basically open. Mowed grass and lots of elevation, with huge trees to add challenge. Long - a couple holes over 600'. Gold and blue marks on top of baskets point to dual tees. From downtown; I-95 north past I-64 to exit 80. Right on Hermitage Rd. cross over 95, left into park. From the north; I-95 south; Chamberlayne Ave. (exit 82). At 4th light turn right on Westbrook to end and right on Hermitage. In park; cross bridge, go uphill, keep right. 1st tee across from shelter by benches. Very good course, I travel to play this one. The hole's are perfectly situated for fun and a challenge. Amazing course, very well kept. Rolling green hills with giant trees. Very open with good variation in hole length. I agree with everyone above if this course had better tee boxes it would be perfect. Beautiful landscaping and challenging play make for a wonderful experience. Lots of other golfers out there but never had to wait. Did however have to watch out for the occasional park goer walking through holes or standing next to baskets around the pond. 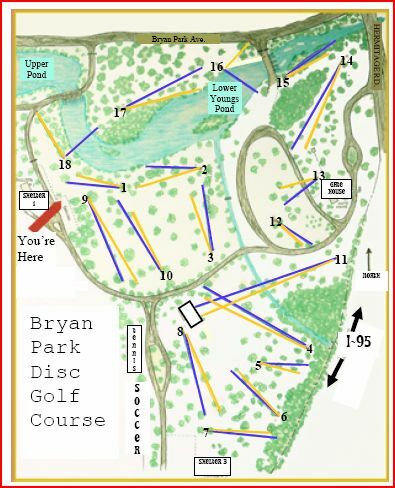 Nice course if you like to "huck it." There has been recent construction on the course and some changes to a couple of holes. The relocation of 18 from across the water was really disappointing. This is a solid course for the area. Played course in March, and loved it. Needed locals to show where some baskets were, but I do agree with the other commenters. Will have to play again in the summer. Really nice course with some long holes and good basket placement. There were a good amount of people playing, but never really a wait. Good players and nice people. Agree with throwinrocs, if the tee boxes were concrete this course would be a 5. This course could be a perfect 5. With some nice signs and concrete tees, this would be one of the best courses I've ever seen. The course itself is beautiful with rolling grassy hills and huge 100-150 year old oaks carving the fairways.